ENTER TO WIN A 4 PACK OF TICKETS TO SEE TOP GUN! Do you have THE NEED, THE NEED FOR SPEED??? 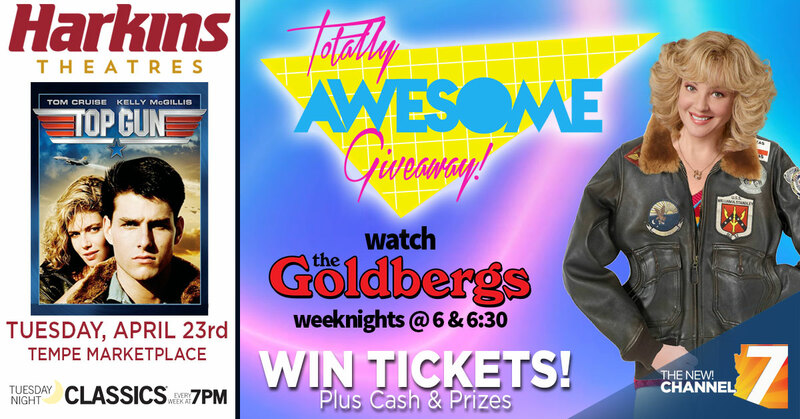 From now until April 15, 2019 enter daily for your chance to win 4 tickets to see Top Gun, Tuesday April 23, 2019 @ 7PM at Harkins Tempe Marketplace. We're also giving away cash and radical prizes (must be present at screening to be eligible), so don't miss out! Gift Cards and Random Prizes will be drawn via raffle at the screening. Must be present to claim. Enter the correct Code Word, two per day. Enter each day during the Sweepstakes window (April 1st – April 15th, 2019) to increase your chances to win. Gift cards and other prizes at the Top Gun Screening. Must be present to win. Starting April 1st, 2019 at 8a, enter online until April 15th, 2019 at 11:59p at aztv.com/win for your chance to win. Two entry per eligible person, per day during contest entry period. All winners (20 total) will be randomly selected by KAZT contest software. Winner must claim their prize the night of Top Gun Screening and must present photo identification.